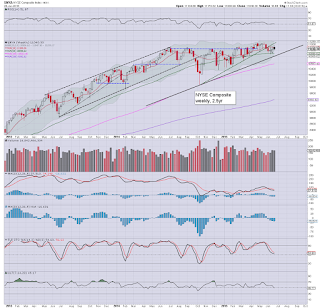 US equity indexes started the week on a positive note, but saw increasing weakness from Wednesday onward. 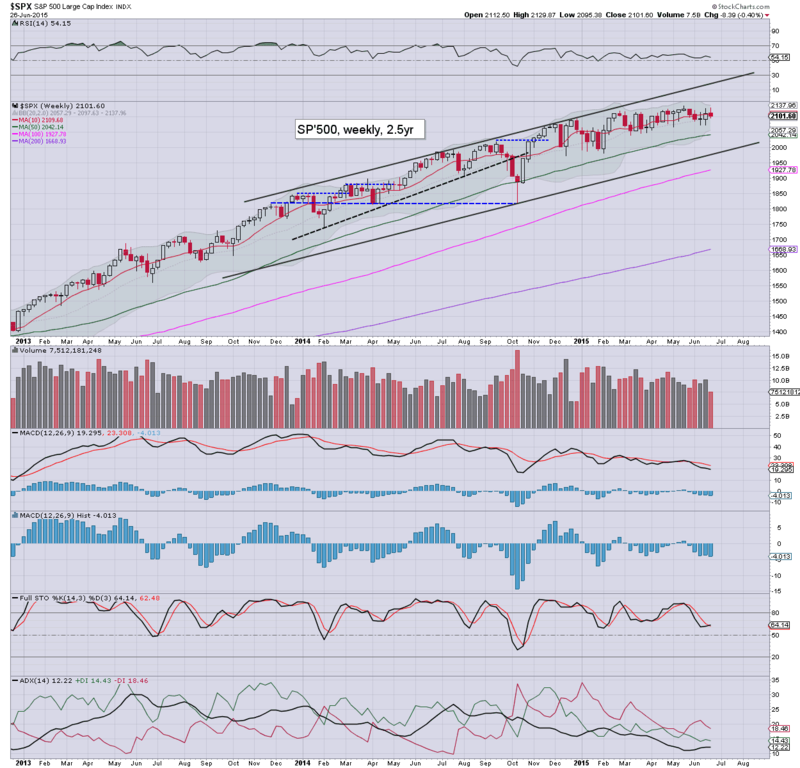 Net weekly changes ranged from -2.0% (Trans), -0.4% (Dow/sp'500/R2K), to u/c (NYSE comp'). 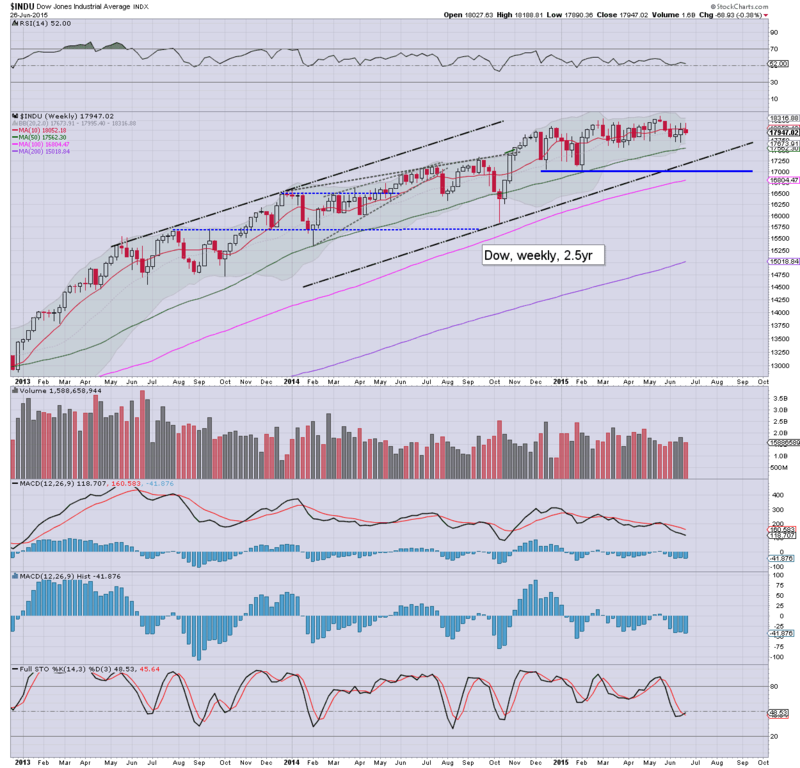 A net weekly decline of a moderate -0.4% @ 2101. 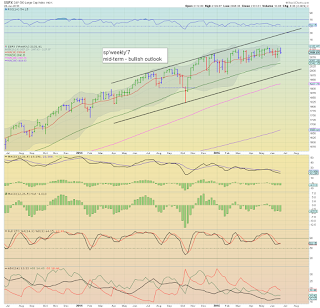 Underlying MACD (blue bar histogram) cycle ticked lower, and was negative for the fifth consecutive week. The lower weekly bol' will be in the 2060s next week, and right now, that is the most realistic 'best downside case' in the current cycle. 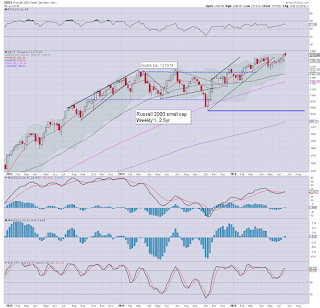 Best guess... sp'2060s, before another lunge higher in July. 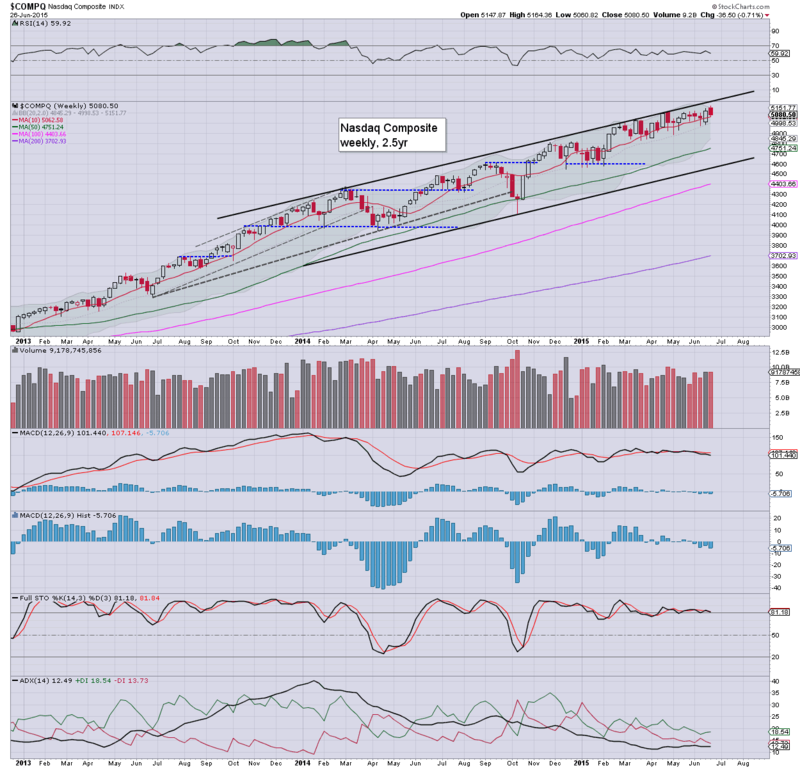 Whether the market can break new historic highs in some (certainly not all) indexes... is very difficult to say. Even if sp'2175/2200 by August, I will be looking for some sig' correction in Sept/Oct, before the 'madness' resumes into 2016. 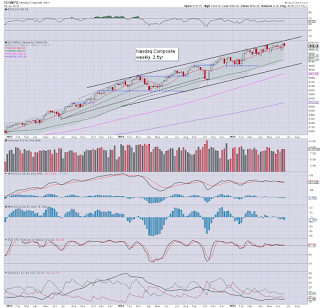 The tech' saw a net weekly decline of -0.7%, but did manage a marginal new historic high of 5164. 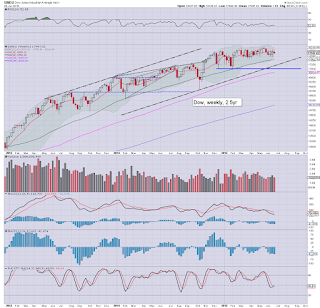 The broad trend remains bullish, despite a MACD cycle that ticked lower, and was negative for the fourth consecutive week. There is viable downside to the giant 5K threshold, best case is around 4800. The mighty Dow saw a net weekly decline of just -0.4%. The Dow remains in a very tight trading range, with a ceiling of 18300s and a floor in the 17500s. A failure to hold above 17500 will open the door to the 16500/000 zone by late summer. 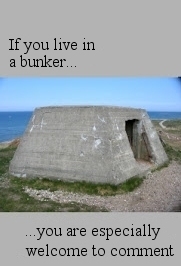 From there...up up up. 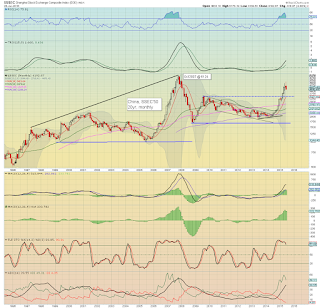 The master index settled broadly flat around the 11K threshold. 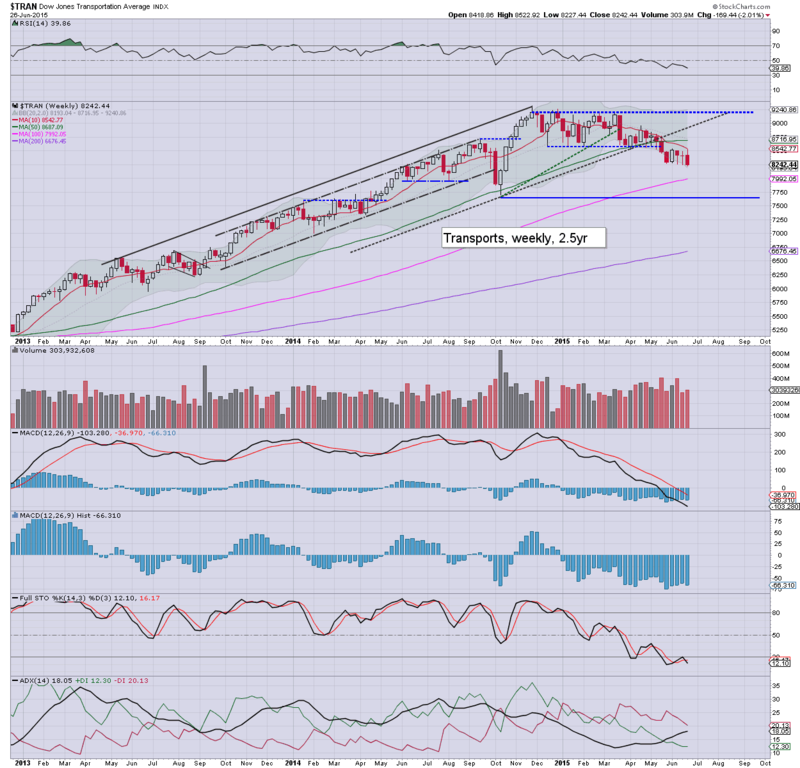 Equity bears need a break <10800 to offer hope of 10K by Sept/Oct. Sustained action <10K looks unlikely. 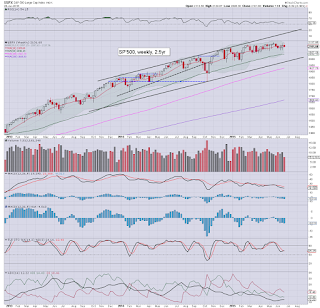 The 'old leader' continues to lag, with another sig' net weekly decline of -2.0%, with a new cycle low of 8227. 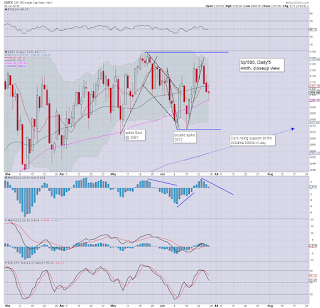 The 8100/000 zone looks due in the near term, with secondary downside to the Oct' low of 7700 by late summer. 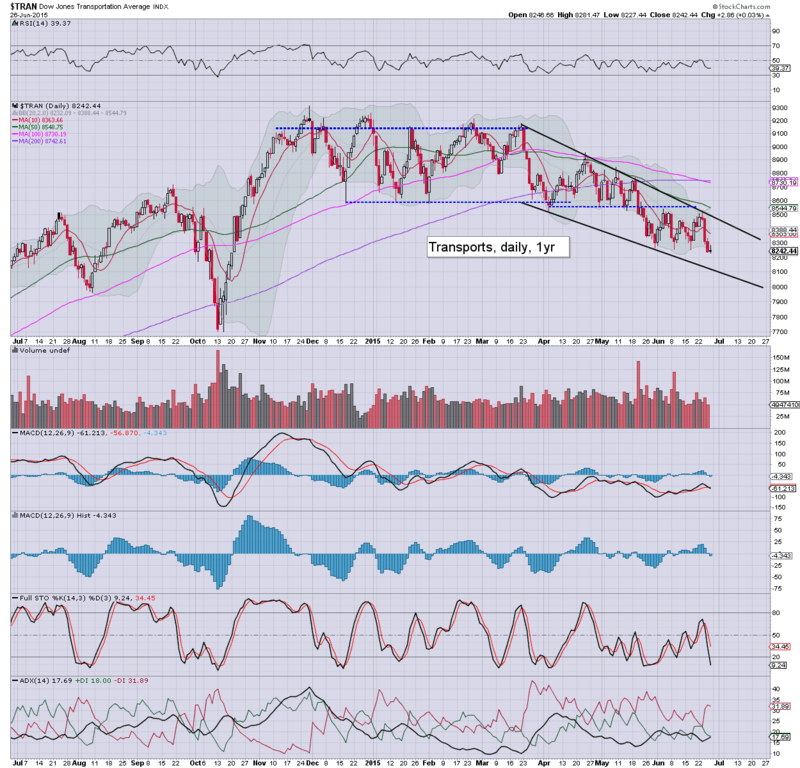 Considering continuing low Oil prices (relative to summer 2014), the Transports are performing very badly indeed. Next week will be condensed, with a three day holiday weekend ahead. As ever, the monthly jobs data will be the key data point. The Greek situation is set to remain an issue. It would seem there will be no Greek deal next week, with the Greek people set to vote in a referendum, which is scheduled for Sunday, July 5th. T- weekly/monthly jobs, factory orders. *Fed official Bullard is set to speak on Tuesday, and Mr Market will most certainly be listening to him for any comments on int' rates.. or the Greek situation. 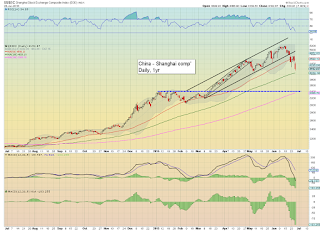 Regardless of the ongoing Greek drama, the most notable aspect of the week were the increasingly wild swings in the Chinese equity market. 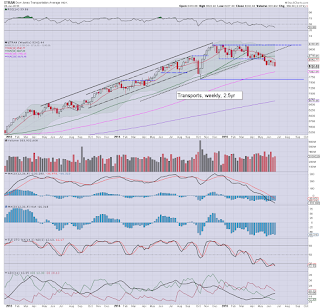 With a Friday net decline of -7.4% @ 4192, the retail amateurs have a worrisome weekend ahead. 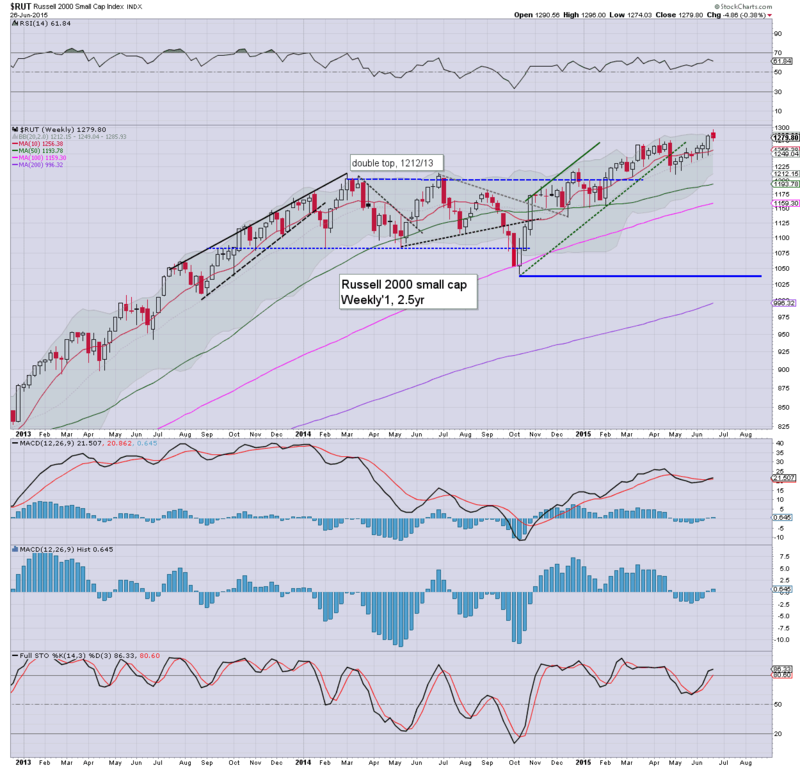 Further downside to the key breakout level of the 3400s remains on track. 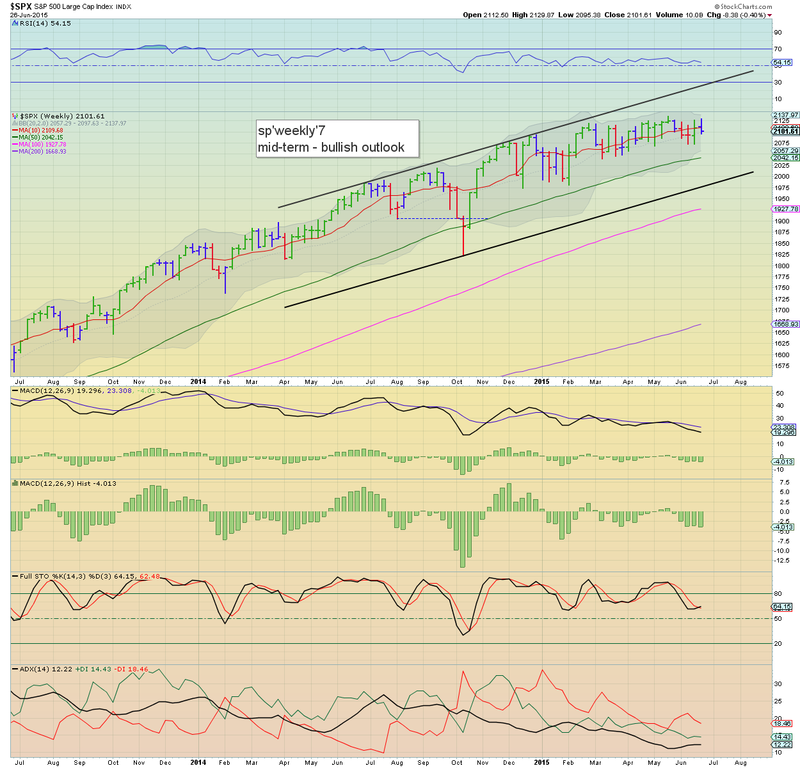 *a sig' net monthly decline now looks probable, which would be the first since June 2013. 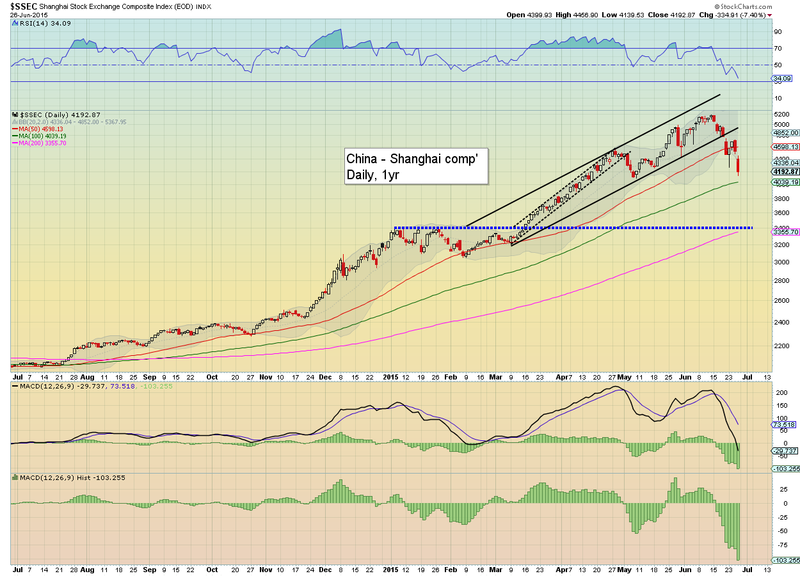 It was a pretty lousy week for the Shanghai comp', with a net weekly decline of -6.4%. 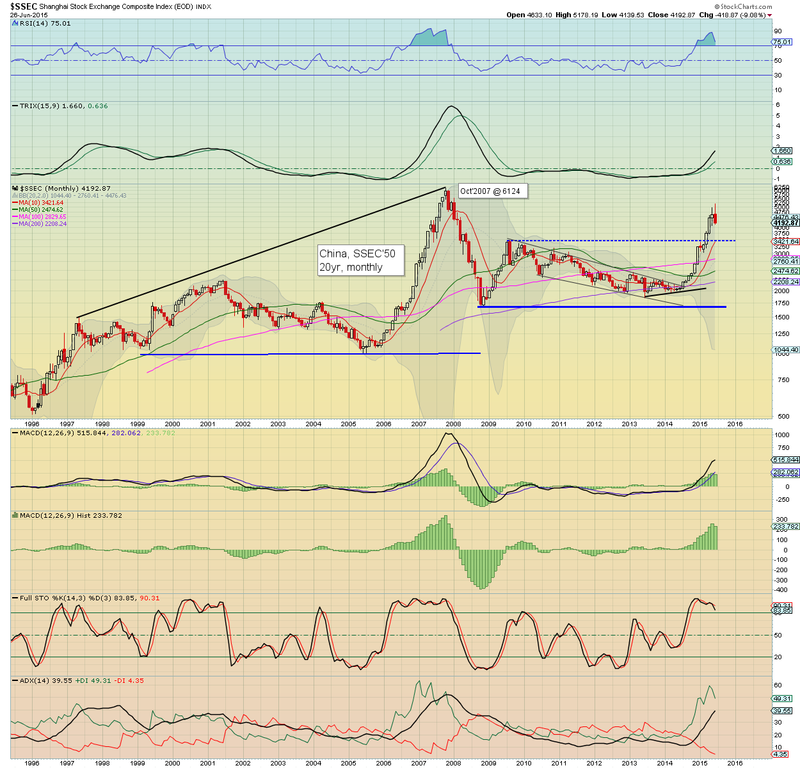 Regardless of any sporadic crazy bounces in the days/weeks ahead, the SSEC looks headed under 4K.. and probably to the original breakout level of the 3400s. That would doubtless spook many of the retail amateurs. A moderate net weekly decline of -8pts (0.4%). 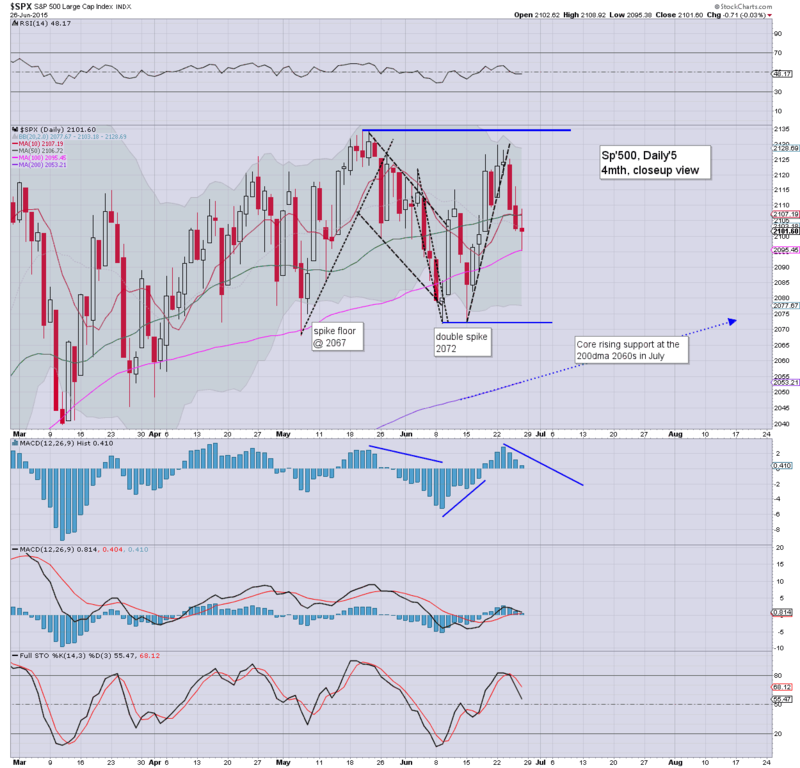 A closing blue candle does offer some hope to the equity bears of further downside next week. The lower weekly bol' will be in the 2060s next week, but that really is about the best any of the bears could be seeking. Greek leader Tsipras has called for a national referendum - Sunday July 5th, to allow the Greek people themselves to vote. I would imagine it will be on whether to pass a deal (itself, yet to be clarified). Clearly, there will not be any Greek deal next week. The payment to the IMF due by end Tuesday will be surely be defaulted on... as the Greek govt' simply doesn't have the spare funds. I would imagine the ECB will give Greece until after the referendum before removing the current bank liquidity program, even if they miss the IMF payment on Tuesday. One thing is for sure, I can't imagine the market will open Monday on a positive note with no weekend deal, and a Tuesday payment likely to be missed. US equities closed somewhat weak, sp -0.7pts @ 2101 (intra low 2095) The two leaders - Trans/R2K, settled u/c and -0.2% respectively. 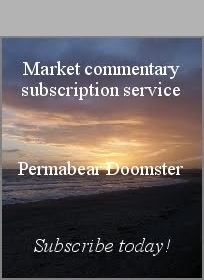 Near term outlook is bearish for Mon/Tuesday, best downside case remains the sp'2060s, with VIX 16/17s. 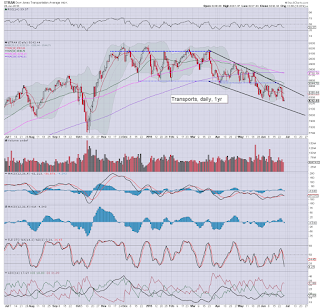 *Transports continues to be the market laggard... seemingly headed for the 8100/8000 zone. 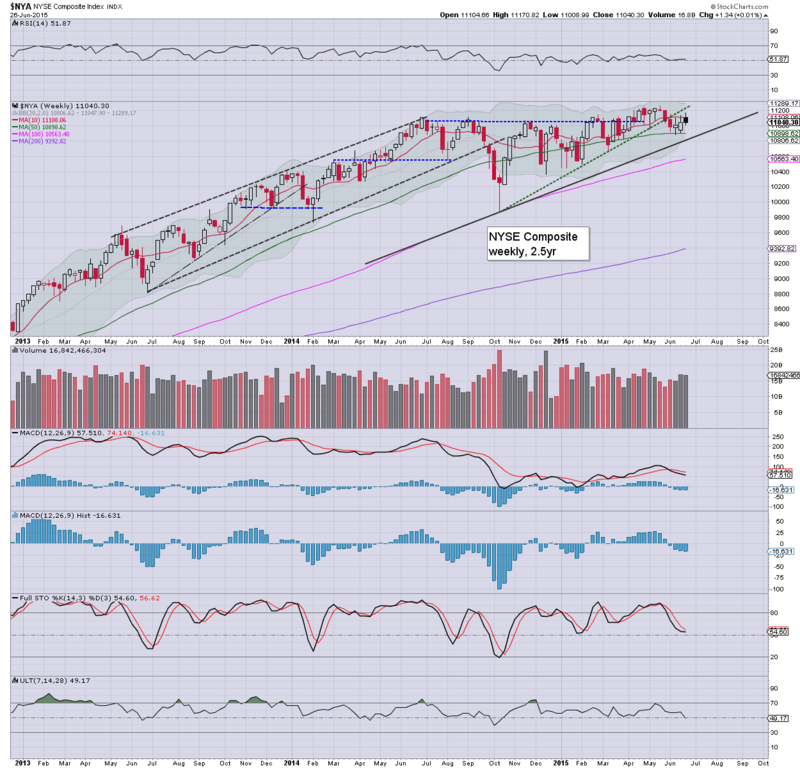 The trading week concluded with a new cycle low of sp'2095, but the market did manage to drag itself above the sp'2100 threshold for the weekly close. All things considered, market looks set for further downside next week.... the bigger weekly cycle will be offering the 2060s.